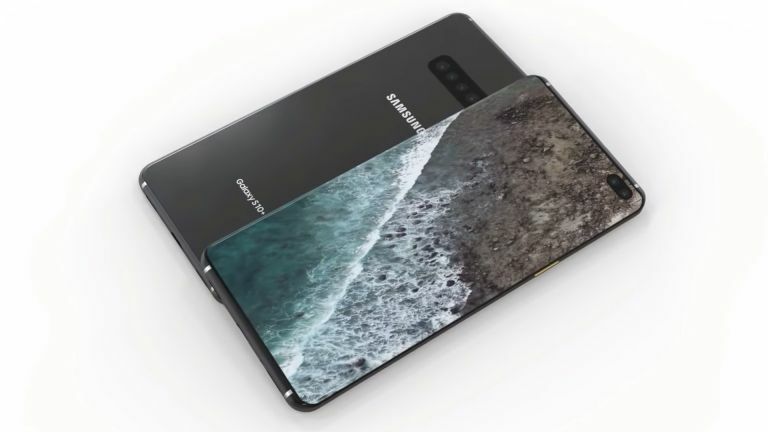 The Samsung Galaxy S10 Plus has leaked in an official photo that reveals exactly what we can expect from the new smartphone, which it set to be unveiled at the Galaxy Unpacked event on February 20, 2019 – and it makes Apple's iPhone XS Max looks old already. Serial leakster and reliable early phone peaker, Evan Blass, has shares what appears to be an official Samsung banner which has the Galaxy S10 Plus in its final form. Check it out below. As you can see Samsung has gone for that punch-hole display which houses the selfie camera in the top right of the otherwise bezel-free screen. What's interesting is that there appears to be a dual selfie camera, as has been rumoured previously. This would suggest 3D facial scanning and recognition could be onboard. Also rumoured as another layer of security is a new type of in-display fingerprint reader that uses ultrasonics rather than traditional optics. The result is apparently a faster and more accurate unlocking process using a fingerprint on the lower screen. Interestingly there also appears to be not only USB-C but a 3.5mm headphone port at the bottom of the handset – something other brands are still controversially leaving out of their phones. Samsung is expected to launch the Galaxy S10, S10 Plus and S10e at its event on February 20, 2019. The foldable Galaxy X is also expected to make an appearance. According to details glimpsed on the official Samsung website, the Galaxy S10 release date is scheduled for March 8 – that's when the first pre-orders will begin dropping through letterboxes, and the handsets will appear in high street stores.